This shower curtain design does not require a liner. 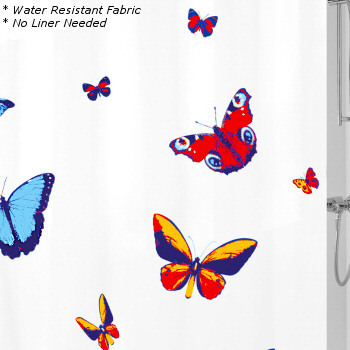 The Butterfly shower curtain is designed and produced by well-known German brand Kleine Wolke, established in 1968, and is backed by their quality guarantee. Quick-dry and easy-care polyester fabric, durable and long wearing. Multi-Color : Bright and bold butterflies flying about on a white fabric background. Primary colors are dark blue, aqua blue, bright yellow orange, red and light blue.